Journey Through the Breach into the world of Malifaux where steam power collides with magic, monsters, and steel. This Fated Almanac is the essential tome for players of the Through the Breach roleplaying game. It includes the core rules, as well as equipment, magic, and background information. Everything you need to become a power-mad Arcanist, lethal gunslinger, or a ruthless mercenary lies in these pages. 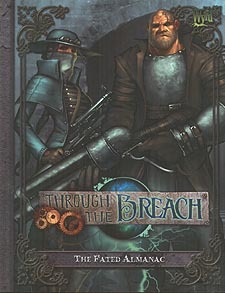 The Fated Almanac is the player's guide for Through the Breach, the long-promised RPG using the same setting as the Malifaux skirmish game. As might be expected from a game with that heritage, the RPG is a little idiosyncratic and defnitely has a flavour all of its own. The book opens with an excellent section on the setting, some might say this is more readable and comprehensive than the setting details in the original skirmish game. Certainly there's enough there for a new player to get a grip of the themes of Malifaux and hopefully some idea for a character or some bare bones plot inspiration for and new GMs. With character generation we get to the first hints that Through the Breach isn't going to play like a conventional RPG. It's absolutely no surprise that the game used cards (a Malifaux fate deck, specifically, although there is a tiny sidebar to allow you to substitute a standard deck of playing cards), what did surprise me is that the first step in character creation is to deal out a tarot-inspired fortune telling spread for your character. Comparing this to a series of tables in the book (looking up each position in the card spread, and what the card is) gives you not only the first mechanics of your character but also this destiny; an obtuse 'Fate' which can serve as inspiration for the GM as well as plot points to aim for. Via a few more mechanistic steps we come to 'Pursuits', essentially career-based skill packages. In my opinion these are what add flesh to the characters, giving focus and more identity to what's already there. Creation is rounded out by putting together the character's own 13 card 'twist deck' (so yes, everyong, including the GM will need their own deck). The game mechanics are reasonably straightforward; a task has a difficulty number, and the character's attribute, plus a card for the GM's shared deck must equal or better that number to succeed. Alternatively, the player can choose the 'cheat fate' and ignore that card, instead playing one from the hand drawn (and seen) from the their own twist deck. It's an interesting (and fun) system, but can feel more like the intent was to create something eccentric, rather than the best system possible. Overall though, yes, if you're interested in the Malifaux setting, I'd say pick this up, or at the very least, give it a thorough, open-minded consideration. the setting is fun, the books are stylish and full of flavour and the mechanics DO work. My only real quibble, to be honest is the return to the old style 'one book for the players and one book for the GM' format, rather than the more usual 'here's a complete game', which I would have by far prefered.